Look at these beautiful babies I brought home from the farmer’s market. They are so juicy and bursting with flavour. These ruby lovelies are the perfect example of why you need to get to know where your food comes from (more on this in future posts)! Conventional strawberries are on the “dirty dozen” list of most pesticide soaked produce, with certified organic strawberries substantially higher in price. 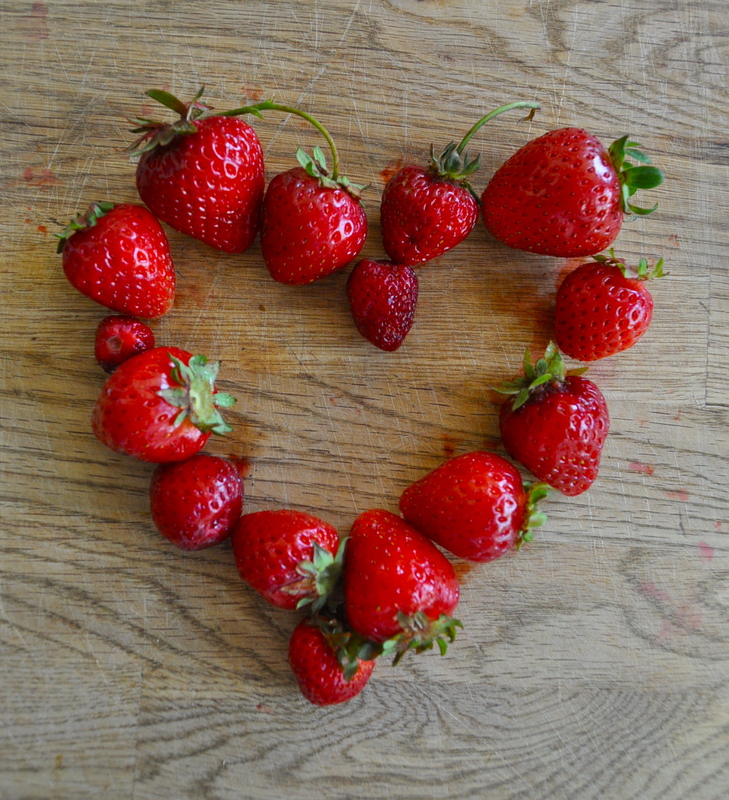 Rather than spending the money to buy certified organic or giving up strawberries all together…. get to know your farmer 🙂 Many farms cannot afford (or choose not to jump through the regulatory hoops) to become ‘certified organic’, but use less toxic methods than conventional farms. The ‘certified organic’ label doesn’t mean as much to me as speaking directly with the person who is growing my food. If you talk to your farmer they will be able to answer your questions as to when their produce was sprayed and what it was sprayed with. You need to know this information! After gorging on these jewels I wanted to experiment. I had been wanting to try jam, but have been scared off by the amount of white sugar called for in most recipes. These strawberries were so naturally sweet that I only added about 2 tablespoons of honey and even that is optional. Rather than use pectin as a thickener I saw an opportunity to sneak in a superfood. 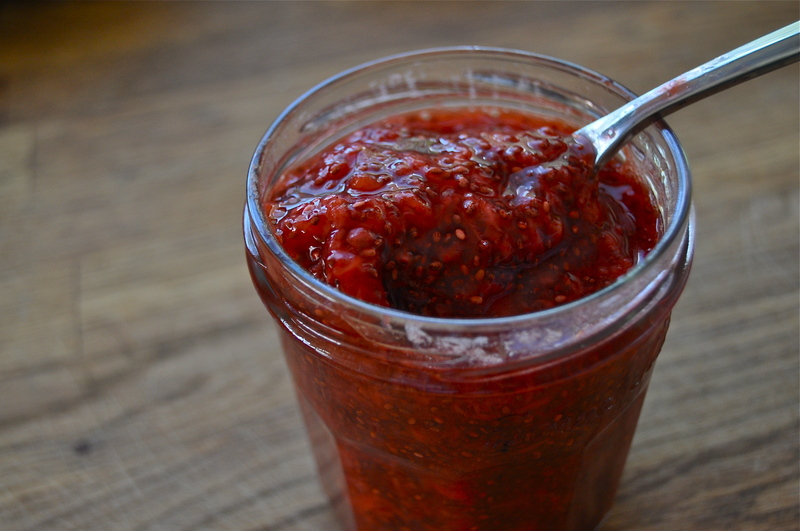 Chia seeds provide the gelling agent for this jam and deliver a great texture and a ton of health benefits. I have to admit I was curious as to how this would taste, but it is so incredibly delicious! It is almost unbelievable that something so much healthier for you could taste so much better than the traditional version (she says while eating jam with a spoon). I plan to make many more batches and experiment with different types of fruit. -2 T honey, or more to taste, depending on ripeness of fruit. Strict vegans can substitute coconut or date sugar, sucanat, maple syrup, or sugar of choice. Scrunch your strawberries (use your hands to slightly mush them) into a small pot. Put over medium low heat. I was terrified that the heat would destroy the flavor, but it didn’t :). Cook for approximately 5 minutes, until strawberries begin to release their juices. (If you would like this recipe to remain totally raw you can omit this step). Take off the heat and add your honey. Stir to blend. Taste. Add more honey, little by little, until you achieve the sweetness you like. Add 2 T chia seeds. Stir for a few moments. Transfer into a jar and place in the fridge. Let rest for 10 minutes before using. If you prefer a smooth jam you can blend it at this point. I love finding little chunks of fruit and leave it as is. If you like a thicker jam add more chia seeds until you reach your preferred consistency. Slice off the tops and bottoms of apple, only cutting off enough to give you a flat surface. Slice your apple across the middle into 6 pieces. Poke out the core if you like. 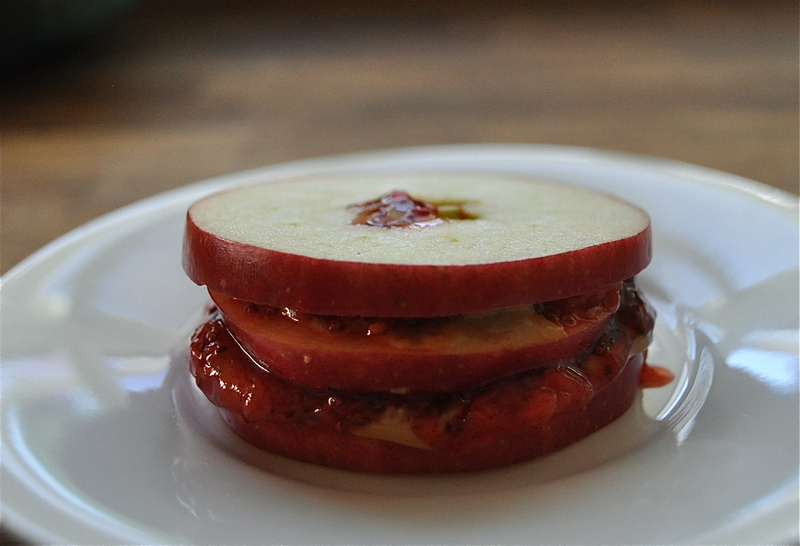 Spread a small layer of nut butter and a dollop of chia seed jam on each apple slice, reserving 2 apple slices for the top. Stack the apple slices together, making 2 stacks of 2. Place reserved apple slices on top. Push together and devour! This entry was posted in raw, snack, vegan, vegetarian and tagged chia, dairy free, easy, fresh, gluten free, healthy, jam, pb and j, raw, recipe, strawberry, vegan. Bookmark the permalink. Thank you! They are so amazingly good 🙂 Hope you give them a try! This looks interesting! How long does it keep for? I’m not too sure, it never lasts longer than a couple of days for me as I go through it pretty quickly. I imagine it would keep for at least a week in the fridge. If you try and store for longer, let me know how it goes!